In all the hustle & bustle that came with the holidays (and my book release! ), I forgot to mention that the latest PolymerCAFÉ includes my "Faux Mosaic Clock" article. Check the February 2011 issue to learn an easy alternative to the more traditional mosaic method. And speaking of online clay retailers (and Polyform discontinuing things), it turns out that Polyform is working with three online retailers to carry Cobalt Blue and Zinc Yellow through 2011. As it stands right now, Polymer Clay Express, Munro Crafts and Creative Wholesale will be the only ones carrying these colors. So if you're not a big fan of ordering clay online, you might want to check your local craft stores now for any leftover packages. Wishing you all an amazingly creative new year! Need the Ferns and Squares texture plate I mentioned in the February 2011 Polymer Cafe article? Here's where to find it. Yeah, I'd never heard of them either. Kinda seems like an odd choice to be one of only three vendors. As far as not having those colors listed, here's what Polyform said on their Facebook page: "Polymer Clay Express, Munro Crafts and Creative Wholesale will definitely be carrying Cobalt and Zinc. They may not have changed their websites yet." 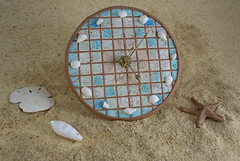 I recently sent you an email with an inquiry about ordering one of your polymer clocks. Is it possible to do so or are you simply a "how-to" source? Laurie, I'm not sure what happened, but I didn't get your email. Sometimes my spam filter gets overly-ambitious! Sorry about that. I'm in between online stores right now, trying to set up my new one in my spare time. We can probably arrange something by Paypal. I'm sending you an email to get more info.